“Uh, water?” asks a waiter in a wispy beard, who looks like Dave Grohl’s cousin. We know his work from fi lms by Oliver Stone, Milos Forman, Spike Lee, Terrence Malick, and Robert Altman. (This month he shows up alongside Will Ferrell in the comedy Semi-Pro.) The compass of his thoughts, however, we know from his favorite books, which include Tom Wolfe’s The Electric Kool-Aid Acid Test, Noam Chomsky’s 9-11, Ayn Rand’s The Fountainhead, Bruce Lee’s Tao of Jeet Kune Do, and John Robbins’s The Food Revolution. As a whole, they are reading matter for a dreamy romantic, a political cynic, a heroic enthusiast cut adrift by society’s outward norms who prefers looking inward. Recently, sitting beside Owen Bickerson at 30,000 feet above the Pacifi c, Harrelson began preaching. “I went on for a half hour, I forget about what—some philosophical thing. But I asked Owen what he thought. He said, ‘I think we’re going to have to fi nd you a soapbox.’ ” In no particular order, Harrelson’s sermonizing runs from raw food to saving old-growth forests to legalizing hemp production to doing away with household cleansers and cell phones. “I won’t use a cell phone,” he says, “because I don’t want to radiate my mind and get a brain bleed.” He volunteers with the Surfrider Foundation, the Earth Island Institute, the Rainforest Action Network, and PETA. He is the personal hero of two-thirds of the diners that night at Cru, and each one tells him so. Despite their endorsements, Harrelson never gets grouped with George Clooney and Barbra Streisand and the Hollywood Left. “I think I live just too far away from Hollywood to consider myself part of Hollywood,” he says. He resides in Maui, somewhere off the grid with his wife and three daughters, where he picks mangoes, eats coconuts, swims in the tropical waters, and reads voraciously. And he has been known to smoke some of the finest weed on God’s green earth . He stands up. 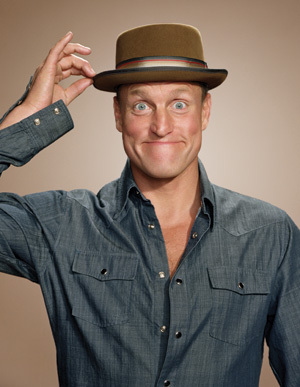 The eff ects of raw food on the digestive system are notorious, and right there in Cru, Woody Harrelson accidentally farts. Not that it mattered. No one had laid down odds on that .